Samosa! The cravings for Indian snack are irresistible. In spite of being oily and rich, our yens for them are insatiable but sadly eating these snacks can take a toll on your health. We realise that taste is what you live for hence, we are happy to bring to you equally tasty snacks that can indeed compliment your healthy lifestyles. Keyword Lip Smacking Baked Vegetable Samosa! Mix all the ingredients for the covering and knead smooth, stiff dough. Rest the dough covered with a damp cloth for 10-15 minutes. For filling, heat a non-stick kadai. Add little oil, add cumin and roast it till it becomes light brown. Now add ginger, chillies, mixed vegetables, peas and mashed potato and mix well. Add chilli powder, amchur, garam masala & salt to the mixture. Cook the mixture for about 8-10 minutes. Add coriander in the mixture and allow it to cool. Then divide the masala into 8 equal parts. Divide the dough into 4 equal parts and roll them into balls. Roll out balls into oval puri. Cut each one into ½ and moisten the edges with water. Shape each half into a cone and stuff the filling in it. Press the open edges and seal it nicely. 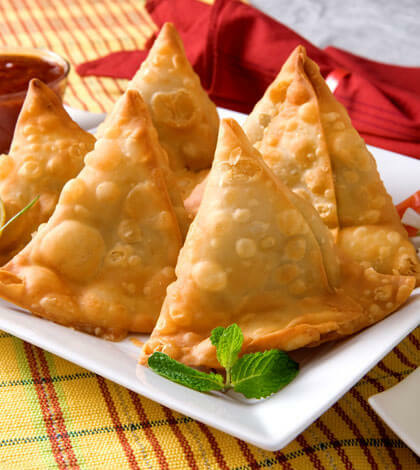 Bake the vegetable samosas in the oven for 20-25 minutes turning their sides in every 5 minutes. Prepare your own healthy snack and comment below to inspire us with your own recipes! Recommend Read: Healthy Green Papaya Salad Recipe.